Having completed the opening meter read process ERS monitors each supply for periodic meter readings. ERS checks that, for each valid settlement cumulative register there exists a valid reading (D0010) in line with the reading cycle and based on business rules the supply is referred to a work list for user investigation when a valid read has not been obtained. ERS monitors the supply portfolio to highlight cases where annualised advance information (D0019) would be expected to have been received but hasn’t. If, on any given day, the ERS system identifies that a supply has not received annualised advance information in line with business rules, ERS places the supply on a work list for user investigation of the root cause of the missing annualised advance data. ERS monitors for failed read notifications (D0004) on an ongoing basis and work list for user resolution. 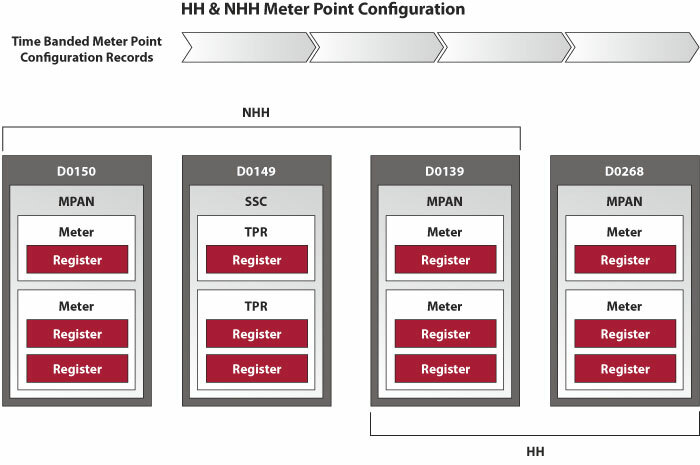 For all NHH supplies, ERS uses the data from the D0019 data flows to maintain the MPAN NHH AA/EAC history, such information is accessible via a user interface. These details are recorded in ERS and maintained in line with the AA/EAC History. The data is compared to other ERS data and where conflicting data is identified exceptions are placed on a work list. Based on the Profile Class associated with each of AA and EAC specified in the D0019, ERS checks that the total AA and EAC in any period does not fall outside an expected range of values (the minimum and maximum values for each Profile Class are configurable). After maintaining the MPAN NHH AA/EAC history ERS checks whether all values remain within the tolerance. If they do, then no further action is required, exceptions are placed on a work list where the tolerance setting is breached. Details of the measurement quantity, the value and whether that value is ‘Actual’ or ‘Estimated’ is recorded in ERS. Each time a new value of any measurement quantity is recorded for any HH, the demand in that half hour is calculated and validated in line with business rules exceptions are identified and work listed. Each day, as part of the Day End Processing, ERS checks each HH MPAN to ensure that AI consumption data is up to date. If, for any MPAN, AI consumption data for any date is not received ERS creates a work list. Distribution loss adjustment factors are published and distributed by each Distributor via a D0265 data flow. Using the data contained within these flows, ERS creates a record of the loss adjustment factors applicable to each HH indexed by Distributor ID and LLF. When a D0036 is received, using the MPAN configuration, ERS identifies the prevailing Distributor and LLF and determines the loss adjustment factors that apply to the MPAN on the relevant date. Using these factors, ERS calculates the Distribution Loss for each HH. ERS provides the capability to capture Transmission Loss Multipliers by settlement date and HH. When a D0036 is received, ERS identifies the prevailing transmission loss multipliers that apply on the relevant date. Using these factors, ERS calculates the Transmission Loss for each HH. Suspect data is work listed for user review and action. The complex matrix of data is presented in an easy to use format with tools to support user decision making and action.